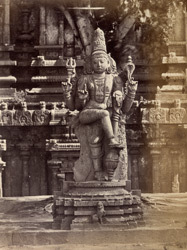 Photograph of a dvarapala sculpture at the entrance to the Jalakanteshvara temple at Vellore from the Archaeological Survey of India Collections: India Office Series (volume 21, 'a' numbers), taken by an unknown photographer in the 1860s. The Jalankanteshvara Temple is built in the Vijayanagara style and dates from the 16th century. The complex is enclosed into high walls and is entered on the south through a high gateway or gopura. This imposing tower consists of six diminishing storeys, renovated in brick and plaster. The walls of the entrance are decorated with mouldings and ornate pilasters in pots, and niches, which have now lost their sculptures. The temple is renowned for the magnificent carvings of the pillars of the Kalyana Mandapa, representing various mythical beasts, which are done almost in the round. This view shows a guardian figure or dvarapala guarding the entrance to the temple.